The Model is initiated by the Arab Council for Childhood and Development (ACCD) and supported by the Arab Gulf Programme for Development (AGFUND). The Upbringing Model that ACCD is practically implementing in all its areas of work and activities is a comprehensive model that aims at developing children's awareness and awakening their creative self, in addition to unleashing their creative human energies and building their abilities, in order to help them live a decent life, achieve positive citizenship and enable them to help their Arab countries towards establishing knowledge society. Under the patronage of HRH Prince Talal Bin Abdul Aziz, ACCD Founder and upon its march and achievements with the developmental support of AGFUND, ACCD has developed a vision based on its accumulated experience over more than thirty years and in accordance with the Convention on the Rights of the Child (CRC) issued in 1989 as well as seeking to achieve the Sustainable Development Goals (2030). ACCD's vision has emerged in logical and integrated contexts to formulate a comprehensive vision in developing Arab children and providing a new intellectual model for Arab child upbringing. The Model of «Education for Hope» seeks intellectually to achieve the integration of three main circles that have been accumulated by ACCD through its experience and achievements while implementing its previous strategic plans. 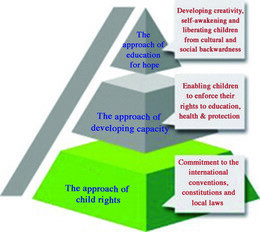 These circles are: 1) the rights-based approach, 2) the approach of developing capacity that is essential in enabling children to enforce their rights to education, health and protection, 3) the approach of self-awakening, education for hope and liberating children from cultural and social backwardness. The integration of these circles according to this trilogy (rights, capacity and self-awakening) ensures developing hope for children who enjoy dignity, honor and the ability to participate in building their society on the basics of knowledge and social justice. The new upbringing model aims to call for formulating an Arab community movement within and among the Arab societies, including legislative, cultural, social, educational and health events. This movement will seek to advocate and support the new model of Arab upbringing, as well as raising awareness of the individuals and institutions concerned with child upbringing regarding the model's principles to activate children's participation and build their capacities, in addition to creating pedagogical environments to ensure their human rights.